Explore Math is a full-year curriculum for high school students participating in alternate assessments based upon alternate achievement standards. It has two components, a Student Book and a Teacher’s Manual. The Student Book has six chapters: Math Vocabulary, Using Numbers 0–12, 0–18, 0–100, 0–1000, and Fractions. Heavily illustrated student activities/worksheets are adult appropriate with life skill themes like shopping, sports, work, and cooking. They incorporate functional skills like money use, time telling, and reading graphs, maps, and thermometers. Large photos clearly depict concepts and help struggling students independently solve math problems. The Teacher’s Manual structures the Student Book into 22 Lessons, each including an objective, material list, and step-by-step procedure. The Introductory Kit includes Student Book and Teacher’s Manual. The Classroom Kit includes 8 Student Books and a Teacher’s Manual. Extra Student Books are also sold separately. 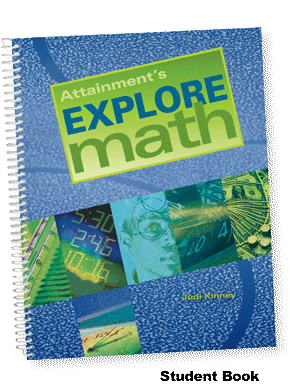 Explore Math Student Book, spiralbound, full color, 183 pgs. Teacher’s Manual, spiralbound, full color, 167 pgs., includes PDF on WinMac CD with a Classroom License for printouts.